This short walk explores the popular village of Goathland, visits Mallyan Spout, the most famous waterfall in the Moors, explores the dramatic wooded valley of West Beck on its way to the village of Beck Hole, and then returns to Goathland along a quiet back street. Not bad in under three miles! This walk starts from the main car park in Goathland. 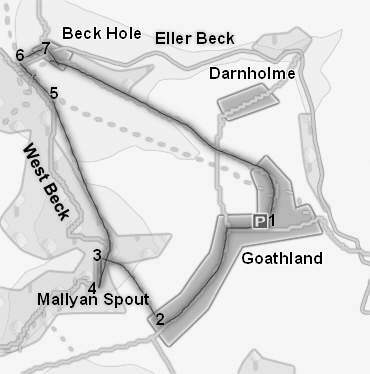 We start at the main car park, on the north side of the main road through Goathland. Cross over the road, and turn right. This is the most touristy section of the village, containing most of the gift shops and tea rooms. At the end of this first section, follow the main road as it turns sharply to the left. One of the most distinctive features of Goathland are the wide grassy verges that line the main road, making the main street feel like a very long thin village green. At the southern end of the village we approach the church on the left side of the road, and a hotel on the right. To the right of the hotel is a footpath signposted for Mallyan Spout. Follow this path past the hotel and down into the valley of West Beck. This section of the path can be rather wet, but is well constructed. At the bottom of our descent we reach the West Beck. Turn left and follow the path along the side of the stream. This is one of my favourite short sections of path in the moors, running along a rocky shelf by the side of the beck, before reaching Mallyan Spout. This is a charming waterfall in a wooded gorge. The gentle nature of this waterfall can best be appreciated when you realise that the path onwards actually passes under the waterfall. From Mallyan Spout we retrace our steps back along the side of the West Beck. Ignore the path we came down, and follow the path north along the beck. Our path soon climbs up away from the side of the beck, which now runs through a steep sided gorge. Our path runs along the top of the eastern slope of that gorge, with fields to our right and a steep wooded slope to our left. The gorge of the West Beck opens out as it approached Beck Hole. As it opens out, our path descends rapidly back down to the side of the beck. Shortly after this, our path reaches the original route of the North York Moors Railway, which now runs along a ledge cut into the northern side of this valley. Turn left onto the old route of the railway, and follow it as it continues along the side of the beck. Follow the abandoned railway for about 600 feet, until it crosses over the Eller Beck. Immediately after crossing over the beck, turn right and follow the path into Beck Hole. Turn right onto the road through Beck Hole, and follow it as it climbs back up the hill towards Goathland. Follow this road as it climbs back into Goathland. Keep going through the village, where the road curves gently to the right, returning to the main car park from the rear.